Serving Size: Always check the serving size of the food item and compare it to the actual amount that you will eat. 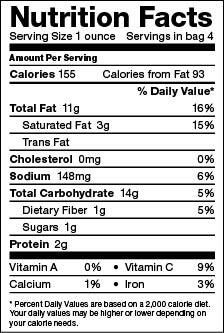 If you will be eating more or less than the serving size listed, you will need to do some simple math on the rest of the Nutrition Facts. For example, if the serving size on the Nutrition Facts label is ½ cup and you are consuming 1 cup of the item, you’ll need to double the information on the Nutrition Facts label. Calories: Monitor calories and how much this food item will contribute to your daily caloric intake. Calories are the measurement of energy in foods and come from carbohydrates, proteins, and fats. Excessive caloric (energy) intake without energy output to balance it out will result in weight gain (and vice versa). Look for items with lower calories from fat. Total Fat: The total fat value includes monounsaturated, polyunsaturated, saturated and trans fat. Aim for about 25-35% of calories from fat. For a quick ballpark calculation, try limiting total fat to no more than 3 grams per 100 calories. Saturated Fat: Saturated fat contributes to LDL (“bad”) cholesterol. It comes primarily from animal products, so look for leaner meats and low-fat dairy products. A good goal is to limit saturated fat to no more than 10% of your diet (or about 1 gram per 100 calories). Trans Fat: Trans fats are primarily found in processed foods and are created when hydrogens are added to a food molecule to increase shelf life. Trans fat is now listed on the food label, but note that a product that has <1 gram of trans fat may list trans fat as “0g”. The goal for trans fat is to consume minimal amounts (preferably none). To identify if there are trans fats in the food product, you can also look at the ingredients label for anything that says “hydrogenated” or “partially-hydrogenated.” Ingredients are listed by weight with the largest ingredients listed first. Cholesterol: Heart healthy recommendations suggest limiting dietary cholesterol to 200mg or less per day. Dietary cholesterol also comes from animal products (meats, eggs, dairy) and contributes to LDL (“bad”) cholesterol. Sodium: Heart healthy recommendations include limiting sodium intake to 2,400mg per day. Sodium can be found naturally in many foods. It is also a main component of table salt, so it is wise to watch your added salt intake as well. One teaspoon of regular table salt contains about 2,300mg of sodium (almost the whole day’s recommended intake!). Total Carbohydrate: Carbohydrates typically make up the bulk of a balanced diet. They contain energy and include sugars, starches, and dietary fiber. The total carbohydrate value is useful for diabetics who are watching to control their carbohydrate intake. For carbohydrate counting, 15 grams of total carbohydrate is considered one serving of carbohydrate. Dietary Fiber: There are two types of fiber, insoluble fiber (bulk) which can help keep your bowels regular and soluble fiber which can help reduce your cholesterol. Fiber is also filling and can help you feel full longer. Aim for 20-30 grams of dietary fiber per day. Sugars: Natural sugars are found in many foods such as fruits and fruit juices. Sugars are already included within the total carbohydrate amount so we don’t really need to look at sugars separately. Protein: Protein needs will vary per person based on size, activity, and medical conditions. Protein can help build and maintain lean body mass, cell function, skin, hair, and organs. It also aids in wound healing, and helps to keep you feeling full longer. Excessive protein intake can put undo stress on your body and organs. Talk with your dietitian about your individual protein needs.